Meringue Nests with Jelly Beans have a lot to do with timing. “Timing is everything”, or so the expression goes. Take Passover and Easter for example. They are celebrated the same week just about every year. I love looking at the beautifully decorated bunny cookies and the gorgeous cakes and I long to bring them home. However, there is one major problem, at least for me. I celebrate Passover and leavened foods are forbidden. So, those tempting treats have always been just out of my reach. I decided it was time to do something about this by making Meringue Nests with Jelly Beans. Meringues are perfectly acceptable for Passover because they are made with egg whites, cream of tartar, vanilla extract and sugar. Nothing that rises. Woohoo! The first batch I made also included a pinch of salt and it would be an understatement to say they were vile. Actually, my friend used other words to describe them, but vile sounded nicer. Fortunately, it isn’t a big deal to whip up more meringue, so the effort wasn’t totally in vain. The meringues baked for 1½ hours and cooled completely before I put jelly beans in them. What I ended up with was my own beautiful holiday treat that was perfect to eat during Passover as well as share with friends celebrating Easter. Best of all, the bunnies are safe! Preheat oven to 225°. Line two baking sheets with parchment paper and set aside. Place egg whites and cream of tartar into large mixing bowl fitted with whisk attachment. Beat on medium speed until soft peaks form. Add vanilla followed by sugar, 1 tablespoon at a time. Beat on high speed until stiff and shiny, about 3 minutes, scraping down the bowl as needed. Cut a corner off large plastic freezer bag and insert large round tip into bag. Transfer meringue to bag and seal, releasing the air as you do this. Pipe nests onto parchment paper. Pipe working from the center of each nest to the outside and then build up the sides. Do this in one continuous motion. The size may vary from nest to nest. Bake in 225° oven for 90 minutes. Remove from oven and cool completely. If you prefer to have uniformed nests, trace circles onto the parchment paper before piping and work within each circle. 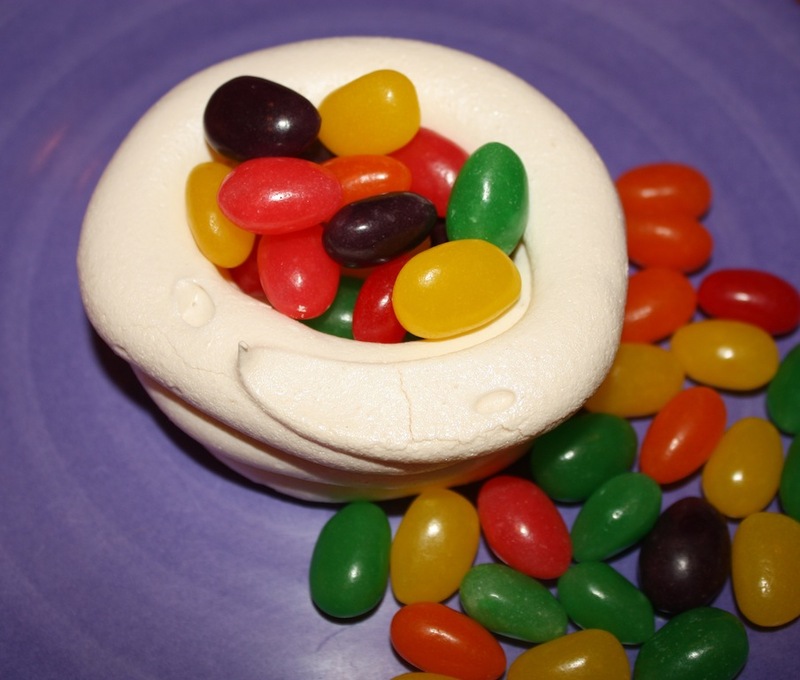 Miniature wrapped chocolate eggs may be substituted for jelly beans.